A sign admired by Martin Luther King Jr.
Pastor Jackson’s pilgrimage and development is one that is rooted in this quote. His life story is one of thanksgiving, change and hope. He continues to offer his mind, body, and spirit to the fresh anointing of God in expectation that he can become all God wants him to be. He began his pilgrimage in Washington, DC and was raised in South Carolina and New Jersey. He has the good fortune to have been raised with both southern hospitality and northeastern finesse. He obtained his early education in the segregated schools of South Carolina, while his high school and college educational experience was in the northeast. Coming from very humble beginnings, he was a proud participant in the second class of the EOF program at Saint Peter’s College in Jersey City, NJ. During his junior year at Saint Peter’s College, two milestones happened: he took his fist plane ride and he was afforded an opportunity to study at the American University in Cairo, Egypt. Upon graduating from Saint Peter’s College, he began his theological education at Colgate Rochester Divinity School in Rochester, New York and received a Masters of Divinity Degree in 1976. Rev. Jackson began his pastoral career at Monumental Baptist Church in Elmira, New York in 1975 and served there with distinction until 1984. At the age of 33, he was called to pastor Mount Olive Baptist Church in Hackensack, NJ where he has labored for nearly 30 years. As pastor, he has attempted to teach and preach a holistic gospel, which includes the individual, the family and the world. He believes that mature Christians should not only witness about their personal salvation in Jesus Christ, but also about their relationship to Christ as it affects their family as well as their public policy around the world. Pastor Jackson has led his congregation to be doers and hearers of the word. He encourages them to be generous in giving to needy persons at home and abroad, but to also be politically aware as they seek to do justice for God’s people around the world. As a community activist, Pastor Jackson demonstrated his faith in various capacities over his 25-year ministry in Bergen County. 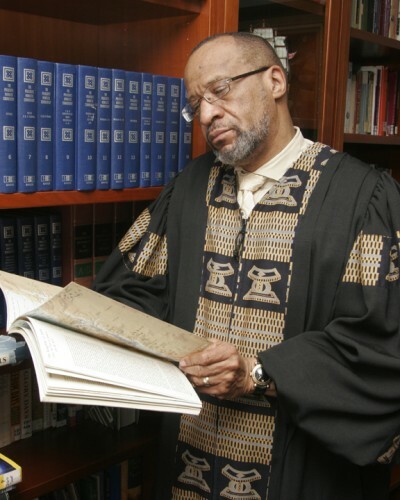 He has served as a member of the Bergen County Council of Churches for more than 20 years and most recently served as the first African-American President for 3 years. He has served as the President of the Hackensack Board of Education, and as a member of the Hackensack Housing Authority and several other committees in an effort to bring about racial and ethnic harmony in the community. To that end, he was the founder of the Interfaith Brother-Hood and Sisterhood breakfast in Bergen County, a group that brings together hundreds of people from more than 10 faith communities. Pastor Jackson presently serves on the boards of the Lott Carey Baptist Foreign Missions, Baptist World Alliance and the Baptist-Islamic Taskforce. Pastor Jackson believes in transforming the world into the kingdom of God; he has led Mount Olive in her effort to be a part of the redemptive work of the gospel around the world. To gain a better insight of the need for global missions, he has traveled and preached extensively around the world in China, India, South Africa, Zimbabwe, Australia, Brazil, Argentina, Cuba, Nigeria, Turkey, Guyana and Jamaica. Under his leadership, Mount Olive Baptist Church has been able to complete the building of a 28,000 square foot Family Life Center. This building was built to the glory of God and to the service of humanity. During his tenure as pastor, he has served on the faculty of Saint Peter’s College in Jersey City and lectured at Bergen Community College. He has given prayers before the US Congress and the New Jersey State Assembly. He has been very active in the local politics of the Democratic Party and was delegate to the Democratic Conventions in 2004 and 2008 and was appointed by Senator Barack Obama to serve on the platform committee. He believes in a gospel that is reflected in one’s personal life as well as one’s social and political life. His involvement and ministry reflects his thinking, his reading, and his life experiences. He is constantly studying, reading, developing and becoming. He is never satisfied with who he is. Pastor Jackson is married to Barbara Rose Jackson and has three children, Michael, Monique and Aashon.